These ministries include the pastoral ministry of our Clergy, support ministries such as Care Cards, Prayer Shawls, Transportation ministry, and Caregiver Support. Our Eucharistic Visitors also bring the sacrament to those who cannot attend worship. Stephen Ministers are trained lay people who provide a caring ministry to those facing a crisis. Read the summaries below and follow the links to see how you can get involved. The Daughters of the King and Brotherhood of St. Andrew pray regularly for our extended prayer list, and we include many of these requests in our prayers during worship services. Contact us with your prayer request: eharres@peterandpaul.org. Help us understand the purpose of our prayers and how long you would like us to continue to pray. Please be sure to receive permission from your loved one to include them in the public prayers of the church. The Clergy are also available to support you. If you need to speak to a member of our clergy outside our normal office hours, please call the Parish at (770) 977-7473 and select option 8 to be forwarded to the clergy on call. Grief Share is a 13 week grief recovery support group with weekly videos featuring some of the nation’s foremost experts on grief share topics. Each session is combined with a group discussion of topics from the video and a time for sharing one’s own story and feelings. Grief is hard work, but you don’t have to do it alone. If you are struggling with your grief, feeling isolated or just needing some support. please consider joining us. This group is open to the community, so please share this information with anyone you know that is grieving the death of a loved one. Contact Elisa Harres at eharres@peterandpaul.org or 770.977.7473 for more information. We provide compassionate care to those who care for others. If you are caring for a spouse, parent or child with a chronic condition, then you need support as well. We meet on the second Thursday of each month in room 1 from 12:00pm to 1:00pm and share struggles and blessings in a supportive environment. Parishioners who are homebound or living in assisted care and are unable to attend church on a regular basis would be more than delighted to receive visits from their church family. This ministry provides visits on a rotational schedule and transportation to church events. 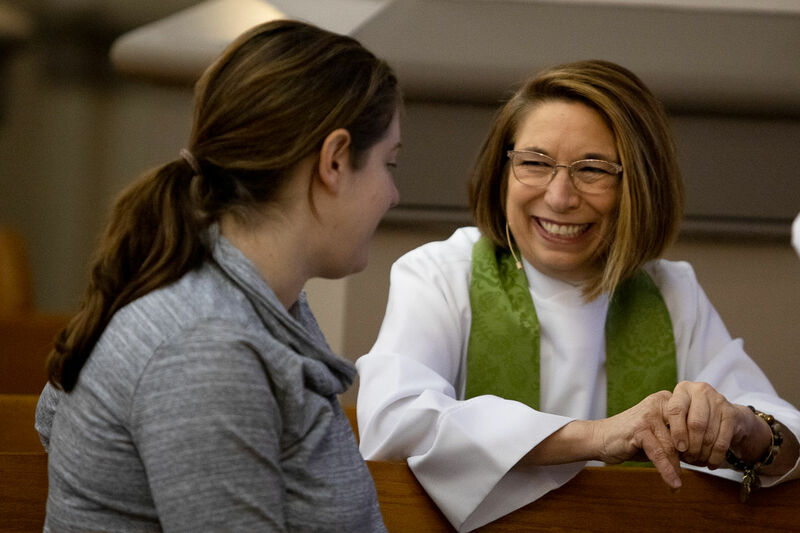 We provide compassionate care through lay people who are licensed to bring Holy Communion from a worship service to individuals who, for illness or infirmity, cannot attend. For more information, or to request a visit, contact The Rev. Elisa Harres at eharres@peterandpaul.org. Knitters meet every other Thursday and knit shawls for people who are ill or shut in. These knitters pray over their work, and the finished products are blessed by the clergy before being delivered to their recipients. They also knit caps and baby blankets for our new baptismal candidates, which are also blessed. These are available to anyone in the parish who knows someone that would benefit by being wrapped in prayer by a homemade shawl or blanket. Contact the church office if you would like to pick one up. 770.977.7473. Contact Polly Sapitowicz at psapiyowicz@gmail.com for more information. Cards are sent form the parish to those listed on our church prayer list to cheer up those who are ill, comfort those who are grieving, and to celebrate events such as baptism. Contact Marcia Spurlock at mwspurlock3@gmail.com for more information. Memorial Garden Angels is a group who work to establish the Memorial Garden as a sacred space. The Garden Angels provide the ongoing maintenance (weeding, watering and trimming shrubs, replacing plants) for the Garden to ensure that it looks great year-round. You are encouraged to visit the Garden whenever possible for a moment of quiet reflection or just to catch your breath and enjoy the beauty of the Garden. Contact Todd Butcher at butchers@comcast.net.